I had no idea I had a temper until I had kids. I’ve been on a mission to tame it ever since then. It’s been the most painful and humbling journey of my life. I’ve shared a lot about it on the blog. I’ve made progress. I’ve been proud of the progress I’ve made. And then one afternoon, right after church it happened. I didn’t expect it because I’d been doing good with my temper. I’d been keeping it together. I’d been aware of my pressure points and paying attention to my own short fuse. But no one can push our buttons quite like our kids can. And one of my kids was so defiant, so rude, so unreasonable that it happened before I could process it was happening. It was just there. Rage. Rage poured through my veins like red hot lava. Like poison. And I turned on him. I turned on the boy I love, the boy who has taught me more about my own temper than anyone else. I turned on him as he sat deliberately not looking at me at our farmhouse table and I started screaming. I screamed directly into his face. I screamed so long and so loud that my throat hurt. I screamed long enough to hear my inside voice begin protesting in panic —- no, no, no, no what are you doing? Stop, stop, stop. Put on the brakes. Red light! Warning. But there was no stopping. The scream had become its own entity and it roared out of me and deafened me and shamed me and still I kept right on screaming. My throat hurt for three days after that scream. Every time I tried to talk to my kids I was reminded of the damage I had done. The guilt sitting there scratching the back of my throat. By the time I was done my temper tantrum both my other kids were crying as well. I slid to my knees and my wide, stunned eyes took in the chaos I’d created. These are the kids I would die for. But I won’t reign in my temper for them? Anger is the dark underbelly of motherhood that no one talks about. Because who wants to admit it? Who wants to say out loud the things they wish they’d never said. No one wants to be that mom. But I have been. I’ve been fighting for years to get off that merry-go-round of frustration and yelling and blaming and do-overs and overs and overs. It’s been very slow going. And even after years of progress there are still instances of set backs like that Sunday. So I get up off my knees and go to find my boy. He’s sitting in bed with the covers pulled over his head. I don’t even try to make him look at me or come out. I just sit down and start talking to him. I stare out the window and describe my own childhood. My story of a father who loved me, no doubt, but who would also let his temper pour out of him in hot, angry words that burned my tiny heart. I tell him all this and it hurts to say out loud. I tell him that I don’t want this to be our story. I tell him that I want to write a new story. I don’t want him to remember that his mother screamed; I want him to remember that his mother was a safe place. As I’m talking his hands are slowly lowering the blanket from around his face. And I feel his eyes on me, watching, listening. I keep talking. I keep telling the truth. I tell him that moms aren’t supposed to yell at their kids. I tell him that I am wrong. I tell him that I am sorry. I tell him that God doesn’t yell, He whispers. And I tell him that I believe we can write a new story. Him and me. But that it will take work and that I’m going to do the work. I’m going to do what moms do – we make a plan and we make things better. Slowly he slides over to my side of the bed and I feel his wet face press into my arm. I pull him against me and we sit for a long time and look out at the sunshine through the blinds. I believe in a God who makes all things new. Especially tired moms who battle their own tempers. I believe He is a God who writes new stories and changes the legacy of families. We have been doing the hard work together for years now. And when I look back on the legacy of my motherhood this deliberate journey to take control of my temper will be the thing I am the most proud of. The most relieved to have been part of. The most grateful. And the place I’ve seen the most measurable progress in my life. Trying to take control of your temper while you’re in the middle of it is almost impossible. The trick is figuring out how to take control of your temper BEFORE you lose it. That’s where you win the battle. That’s where we’ve seen the most change in me and so also in our family. So I’ve finally done something I’ve wanted to do for YEARS! I’ve packaged up everything I’ve learned (the hard way) over the last decade of parenting so that you can put it into practice in your own homes. And I’m calling it The Temper Toolkit. It’s not perfect because I’m not perfect. But it’s how we took real life action for real life change in our home. And that change had to start with me. So for the cost of one exhausted drive-through dinner with the kids after a day of meltdowns, I’d love to sit down with you and share every single thing I’ve learned about taming my temper. Because I believe you actually can. 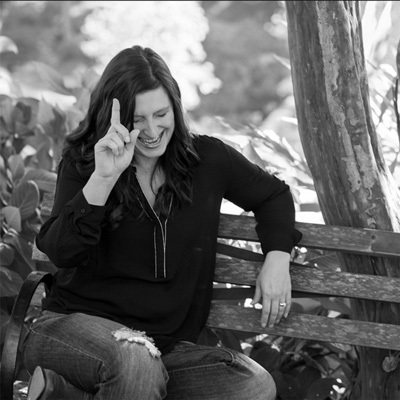 FAST ACTION BONUS: The first 50 people to join will also get a FREE COPY OF MY BOOK – SURPRISED BY MOTHERHOOD! Gosh, those sure went fast! 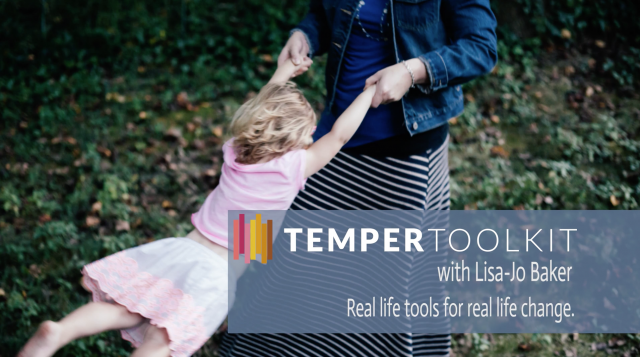 Click here to get access to my Temper Toolkit. We had a rushed morning today (why do kids always sleep in on the mornings when you have to be out of the house earlier?). I immediately thought of your free video and PDF that I downloaded yesterday. I kept it light, fun, and ‘on the same team’ and we made it out the door and through the errands we had to squeeze in before we met friends for a fun morning. Such a feeling of relief, peace, and I JUST CONQUERED THE WORLD when it all happened without tempers (mine or theirs). Thank you! Thanks so much for sharing this Lisa-Jo, it couldn’t have been easy. We’ve all been there in our own way. Loss of control. Guilt. Regret. Wondering how we can erase the memory from our kid’s heart. Praying to God they won’t remember it. Its tough stuff. But so is motherhood. Its messy and imperfect and wonderful. You have a good heart and you are a great mom. Your kids know that you love them and that’s what matters. And now, because of this “event,” they know what redemption is. I signed up for the toolkit and it has debited my account, but I haven’t received an email….might be a typo in my email address (iPhone and I don’t always see eye to eye) ;) Can you check for me? I’m in tears as I sit hear listening to what I heard on your video! I read very few blogs and do very little social media because I think its distracting! BUT I need this temper class I’m SO SO disappointed that i missed it!!!!! Can I get access to this SOON? I’m desperate!